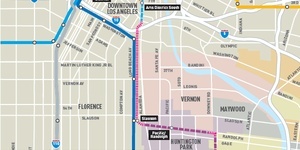 Metro is evaluating a new light rail transit line that would connect downtown Los Angeles to southeast LA County, serving the cities and communities of downtown Los Angeles, unincorporated Florence-Graham community of LA County, Vernon, Huntington Park, Bell, Cudahy, South Gate, Downey, Paramount, Bellflower, Cerritos and Artesia. The West Santa Ana Branch (WSAB) Transit Corridor Project is a 19-mile corridor that is undergoing an Environmental Impact Statement (EIS)/Environmental Impact Report (EIR) process to prepare the corridor for light rail use. The project’s name originates from the southern portion of the route south of the Metro Green Line that follows the old Pacific Electric streetcar alignment known as the West Santa Ana Branch Corridor. The project area is home to 1.2 million residents and a job center to approximately 584,000 employees. Projections show the resident population increasing to 1.5 million and jobs increasing to 670,000 by 2040. Population and employment densities are five times higher than the LA County average. This rail corridor is anticipated to serve commuters in a high travel demand corridor by providing relief to the constrained transportation systems currently available to these communities. 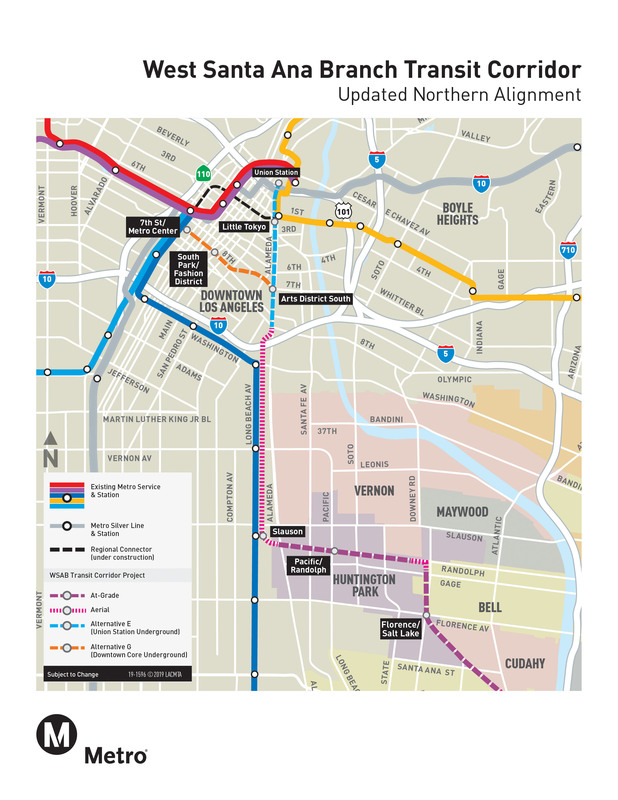 In addition, the project is expected to provide a direct connection to the Metro Green Line, Metro Blue Line , Metro Regional Connector and the LA County regional transit network. This project is also part of the Twenty-Eight by ‘28 initiative that highlights 28 Metro projects for potential completion by the 2028 Summer Olympic and Paralympic Games. Metro formally initiated the environmental process through the original public scoping meetings held for the WSAB Project in Summer 2017. In March 2018, the Metro Board authorized further study of an additional four Northern Alignment options in response to comments received during the scoping period and ongoing technical analysis. These new options were presented to the community for input during the Winter/Spring 2018 Community Update Meetings. In May 2018, the Metro Board selected two Northern Alignment options - Alternative E: Union Station (underground) and Alternative G: Downtown Transit Core (underground) - to be carried into the Draft EIS/EIR for further study. As a result of the new Northern Alignment options, updated scoping meetings were held in July 2018. All comments submitted during that time are part of the official record and will be analyzed and addressed as part of the environmental review process. Based on the comments received as part of the scoping process, ongoing coordination with corridor cities, particularly cities in the south, and ongoing refinement of technical and environmental analyses in order to minimize or avoid environmental impacts, the Metro Board considered and took action in December 2018 that updated the project definition to be used in the environmental studies. As directed by the Board, a separate Feasibility Study will be conducted for a potential station at the LA River and Rio Hondo confluence site in South Gate to determine whether to advance it into environmental review after the completion of the environmental process for the WSAB Project. The current updated end-to-end project capital cost for the two alternatives (Alternatives E & G) is estimated at $6.5 to $6.6B (in 2018$). The cost includes Rough Order of Magnitude (ROM) right-of-way estimates, but these numbers are contingent upon negotiation with the freight railroads. The first-last mile (FLM) cost estimates will be prepared during the Advanced Conceptual Engineering phase and will increase the project capital cost estimate. Public involvement is of vital importance for all communities involved. Therefore, community outreach will continue throughout the environmental process to educate, inform and gather input from stakeholders. To submit your feedback on the project, please use our comment form . Alternative E: Alameda - Union Station Forecourt – station was relocated further east of Alameda Street, closer to Union Station. Alternative G2: Pershing Square design option – station was removed from further consideration. 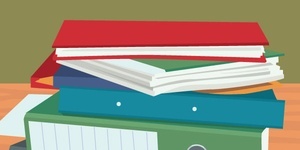 Please use the following contact tools to access more project information, ask questions or provide comments. The WSAB Transit Corridor Project’s environmental process is well defined by federal requirements stipulated in the National Environmental Policy Act (NEPA) and state environmental requirements stipulated in the California Environmental Quality Act (CEQA). The flow chart below highlights the major milestones in the process from beginning to end. The project is currently in the Draft Environmental Impact Statement/ Environmental Impact Report (EIS/EIR) study phase. Various topics will be addressed in the environmental document including land use and planning, noise and vibration, transportation and traffic, parking, and air quality – to name a few. Mitigation measures will also be identified, and community input gathered, incorporated and used to select a Locally Preferred Alternative (LPA). During the environmental process, community meetings and public hearings will take place along the corridor to engage the community, solicit input and address questions.